These are grilled, so I guess they can't technically be called "fries" but they are just as good. Serve with ketchup and garlic-curry aioli for dipping (recipe for aioli below). Toss all ingredients with peeled, sliced sweet potatoes. Start with half the oil and add more if needed making sure all potato sticks are coated enough to not burn and crisp up, but none are greasy. Grill on medium high heat for approximately 5 minutes per side or until browned with grill marks and appear done. Serve with ketchup and aioli. If using fresh garlic, mash garlic into a fine paste with the side of a knife on a cutting board, using salt as an abrasive. Mix all ingredients together, serve with fries. Am I allowed to comment almost two years after the post?? This is a great recipe. I didn't put the potatoes directly on the grill, but cooked them in a pan instead. They were so good I'm going to make a batch this weekend to take to feed fellow beer drinkers at a home-brewing competition. I'm going to use the grill. I like the thin and quick idea. hi! 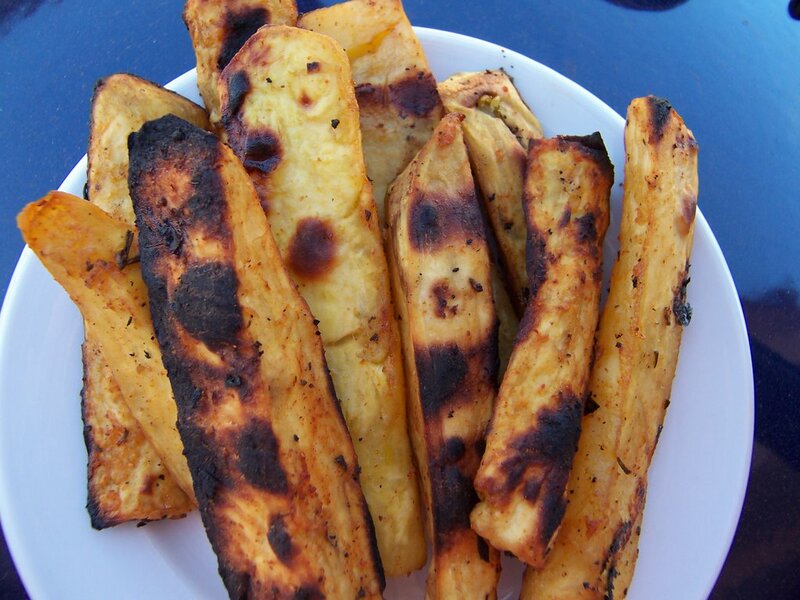 i was looking for a grilled sweet potato fry recipe and your blog was the first entry that came up. Sounds delicious- I'm going to try them right now......AND after perusing your blog I saw your pic and you seem familiar.....THEN I saw you are from Chicago....were you ever friends with Erin Snell? I swear we met at her ex-boyfriend Dan's condo in Bucktown....I could be totally wrong here, but if so, what a small world! I made your Garlic Curry Aioli and loved it with baked sweet potato fries. Thank you for posting it! Sweet potato fries have become a favorite recently (Phoenix has a number of excellent options). Thanks for sharing this recipe! I'm a big fan of grilled potatoes and wanted something a little different than our usual grilled sweet potatoes. I didn't do the aoli or sauces, but the fries came out great. I stumbled onto this recipe and my dinner guests loved this!!! We had the dish as an appy, and it was a huge hit. The garlic curry aioli was amazing. Will definitely make this again! ~a. BEST sweet potato fries I've EVER had! Will definitely be making these more often!! 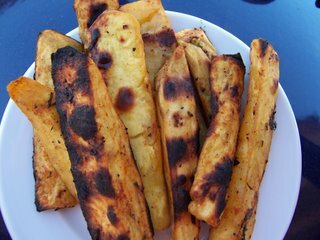 Sweet potato is a highly nutritious and an alternative for food for their valuable contents of carbohydrate, protein and carotene, which are necessary for normal development and even for the sexual development too, believe it or not. Sweet potato is really helpful for welfare and our body. Looks delicious thanks for share. There's a way to make them fill with something ? Excellent, thanks for share, this will taste great with coffee on an evening. Love, Love Love this curry aioli! I used it on top of some black bean burgers too- with fresh avocado slices. THANK YOU! I made these for company last night. They were incredible! We all LOVED them!!!!!! I roasted the sweet potato fries in the oven b/c it was freezing outside. The curry aioli is to die for! Thank you so much for the recipe!! It ROCKS!!!! Cool Article Came across your blog through google, Your blog is so great that I will visit every now and then. Thanks, I'm very glad I could get more knowledge from here, articles and info.